Skargat Fistbrawler, Mighty Basher of the Quicksilver Drake of the Mercuria Vale, is a successful Ogor mercenary captain. As a young, upstart Tyrant, he led his lads out of Ghur following the rampages of Ugluk's 'Ardfist. There was something in the Warchanter's rythm that captivated the Ogors, but more than anything they were attracted by the shiny orruk-forged armours worn by Ugluk's 'Ardboyz. Over years of fighting alongside the 'Ardboyz, Ugluk and his lads had forgotten about gold, and the only shiny stuff they cared for were steel and iron. No surprise that, when the 'Ardfist entered Venythian territory, Skargat and his Ogors were positively impressed by the Gilded Hand battlewizards, in particular their ability to turn anything around them into steel and use it against the Ironjawz. Skargat quickly reconsidered his loyalties and with a bellow led the Ogors against the orruks. The ensuing orruk meat feast lasted for three days and nights and the 'Ardboyz gear were taken as spoils of war. 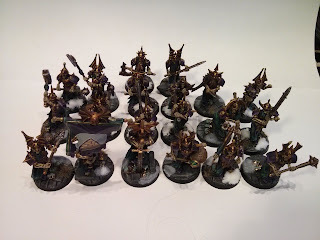 The Gilded Hand elders, for their part, have ever since been more than happy to indulge the Ogors' lust for iron and steel. After all, what are such base materials worth for master alchemists? 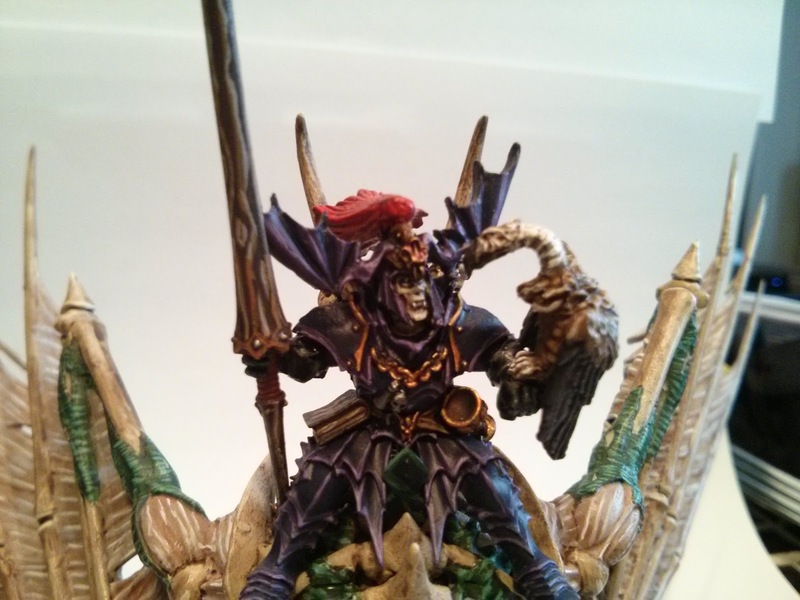 I had converted Skargat a few years ago and he only needed rebasing for AoS. I clipped the square base he was on around his feet and then with a hobby knife I scored the edges, so that the bit of base left would look like another slab of stone once painted and glued on the new round base. Unlike the 1990s Golgfag he wields a double-handed axe, but he still wears a horned helm, which I made out of greenstuff and the tusks from a Orruk Chariot boar. For a while I used him when playing RPGs and during one of his adventures he killed a young dragon. After that epical fight I sculpted the fang that now hangs from his belt. For Kamog, the unit Crusher, I also wanted him to give a hint of the new role played by Gorkamorka as god of all Destruction factions. That's why Kamog's gutplate is painted as copper, so that it reminds the Evil Sun icon. Rather then painting my Ogors exactly like Golgfag's Meneater with black trousers, I went for a slightly brighter blue to contrast with the dark metal of the chainmail. 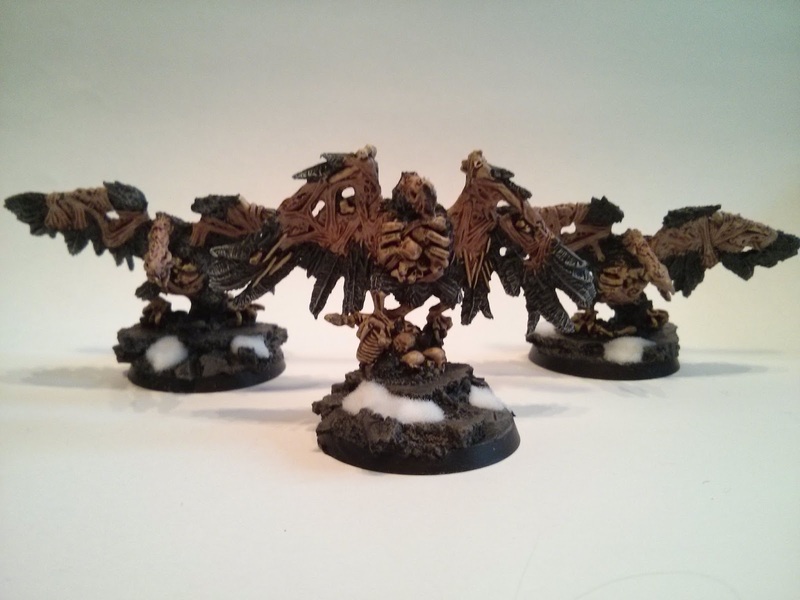 It's not the best blue I've ever painted, but them being Ogors I can always say that they use poor quality fabric. That's it for them... at least for now! 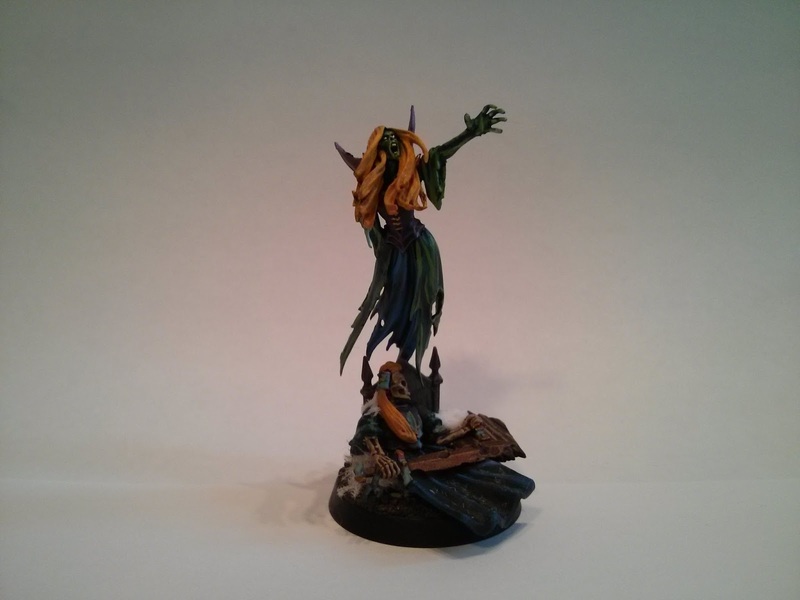 I've just received my copy of Silver Tower and I'm really exited about it. However, there are 40k models nagging at me and asking why I have forgotten them. So I guess I'll take a break from AoS and for a couple of months delve into the grim darkness of the far future. 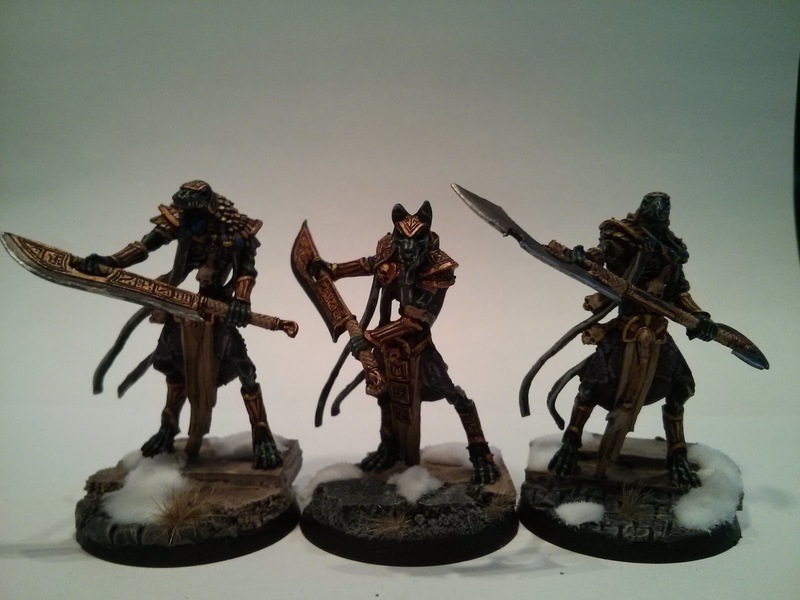 Meanwhile, fellow Talers, please show me some more beautiful models! 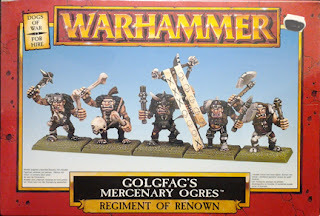 The 1990s incarnation of Golgfag and his Meneaters, much like all Ogre models from that decade, shared many similarities, in terms of weapons and armours, with the Perry brother's Orcs. This meant they were clad in chainmail, carried weapons such as axes and clubs and their legs were armoured. 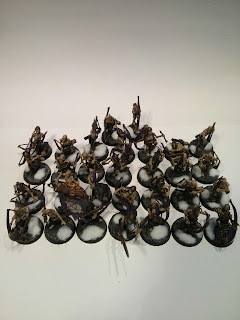 I wanted to keep this link between my Ogors and the AoS Orruks and, luckily, I had some bitz left over from a 'Ardboyz kit I had assembled when they were still known as Black Orcs. This provided me with a good selection of orruk-y weapons. Plus, as I didn't want to mess with the Ogor legs as I love their boots, the armour on the forearms could serve as a nod to the original armoured legs. For the chainmail...you guessed it, a strip of greenstuff was at hand! I started by chopping both the Ogor and 'Arboyz arms at the elbow or slightly above the wrist, glued the 'Ardboyz hands to the Ogors shoulders. I left the heads and gut plates off the models as they would have got in the way while sculpting the chainmail. In my bitsbox there was also a metal Grimgor's axe (this should give you an idea of the time depth of my bitsbox) that I used for the unit Crusher, Karnog, the right hand of Tyrant Skargat. I was a bit worried that no Ogor arm could be adapted to keep the axe pointing forward, but instead the Bellower's arm was angled exactly at the right point. The musician had to carry a drum strapped to its belly, and the 'Arboyz drum, once the hand and arm holding it were removed, fitted perfectly. The side that had been damaged in the cutting of the arm was easily disguised inside the gutplate hole and once the chainmail was sculpted it is absolutely impossible to notice it. Finally, to keep in line with the original, the musician had to have a topknot and I had one from the Orruk Warboss which immediately found its way on an Ogor's head. The original Meneater banner bearer carried a standard, but I find that the Great Beast Skull is a better option game wise, so this time I didn't stick to the original. I didn't either give him a peg-leg, as I said before because I love the Ogors' boots and didn't want to ruin them. 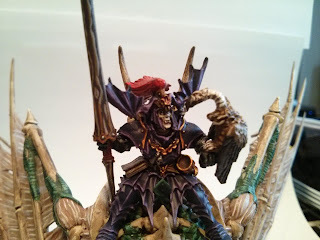 For Skargat, the Tyrant that will lead the band, I had an Ogor converted years ago to wield a double-handed weapon and to have broader shoulders. I'll show him next week once he'll be rebased for AoS. Although Skargat has broader shoulders than the other Ogors, he still is not as tall as the official Tyrant model. 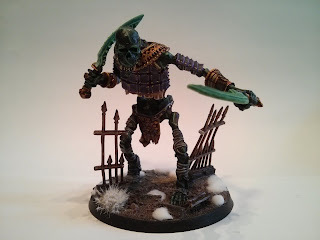 I stuck a piece of slate onto a 50mm base to give Skargat that extra height and then filled the empty space with the club-carrying Grot form the Ogors sprue. They are all primed and basecoated at the moment and I should be able to show the finished gang next week. 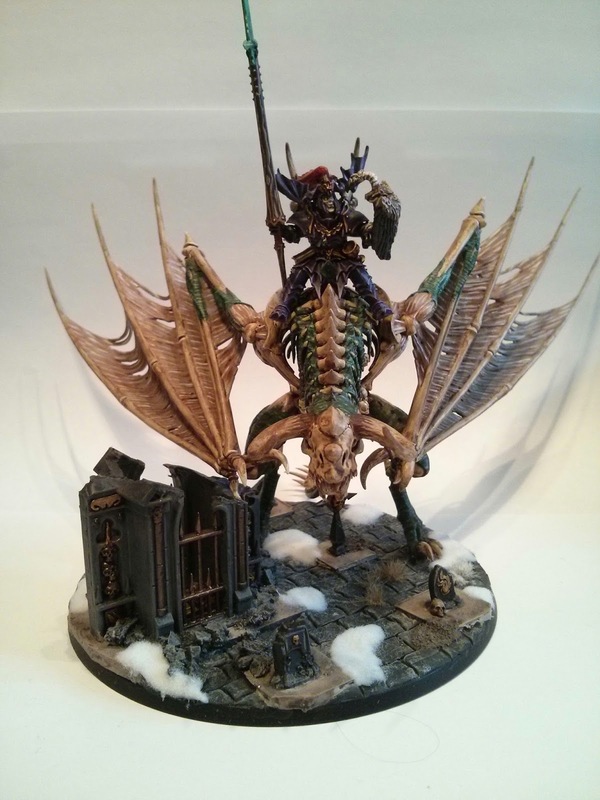 The SCGT update is here! It's been a little long in the making, but here it is. As some of you might know, I went to SCGT. Traveled from Norway to the not-so-distant shores of England for my first international tournament. Ended up in a above-expected place of 48th out of 130. Won three games, lost two and drew the final battle. It was a great weekend. The organizers did an amazing job running such a large event so smoothly. I also met a lot of great people. 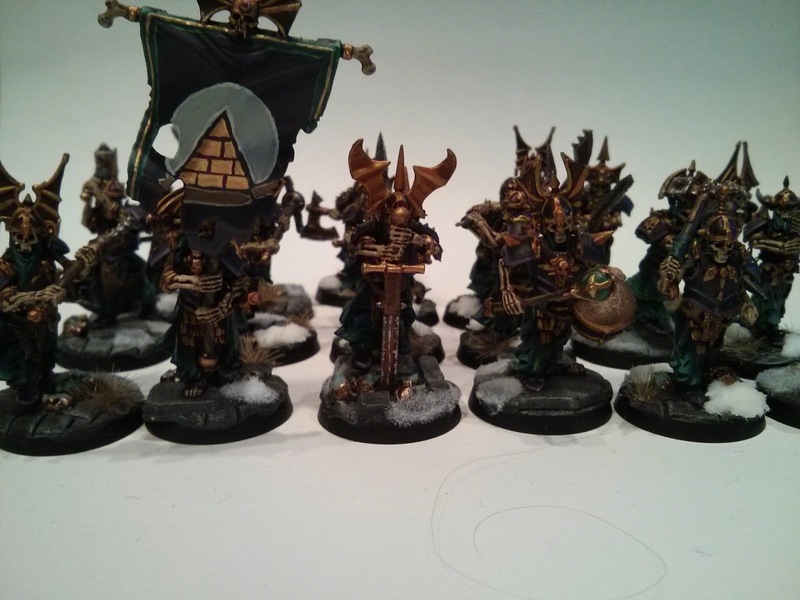 Six good games were had, including a dream match against Steve Foote's amazing Tomb King army. I'll get to that soon. 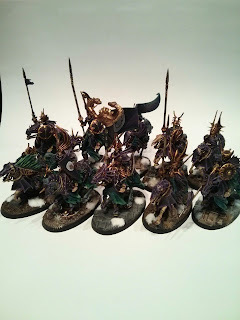 For now, pictures of the army as I brought it to SCGT. 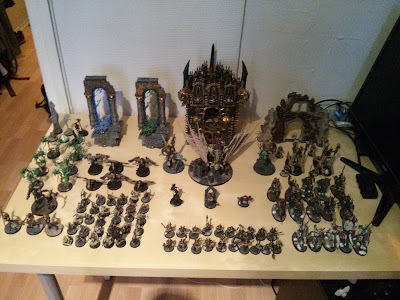 Most of this stuff has been painted between january and the tournament. The only exceptions are the Blood Knights, half the Spirit Hosts, half the Black Knights and Isabella. So a lot of work in a short time, now that I think about it! Gotta start off with that full body shot. 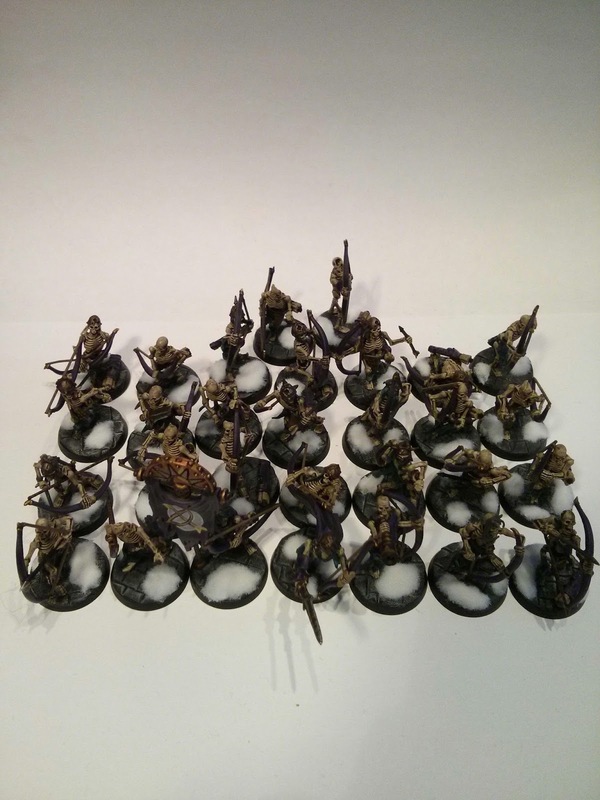 149 SCGT pools, plus 5 terrain pieces. Pro tip kids: don't travel internationally with terrain. Objective markers! 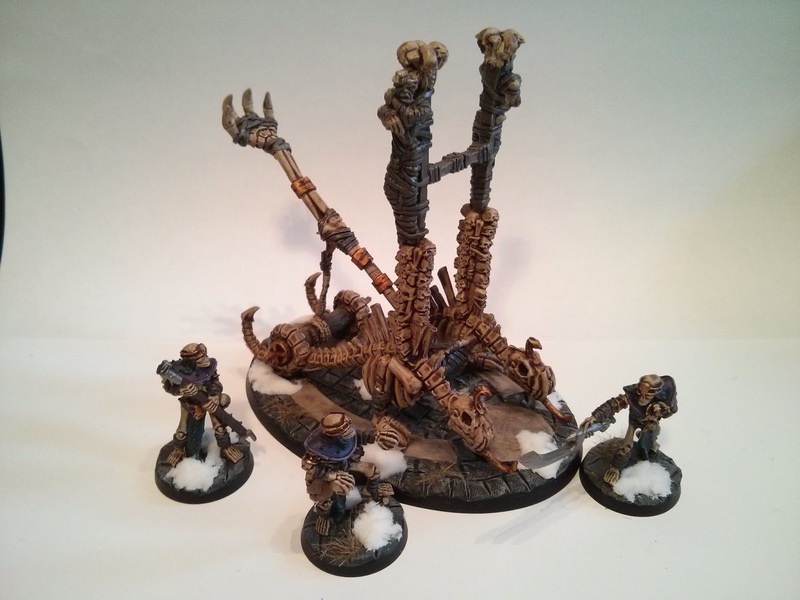 Made from a variety of kits including Nagash, the Giant and Garden of Morr, they are all themed. The chaos obelisk may seem out of place, but it's one of those terrible growths that pop up whenever chaos has been around. It's sought to be destroyed rather than captured. Every objective could tell a story like that. Then we come to the bulk of the army, my archers. They are terrible shots. However, regenerating wounds and shooting twice makes them a serious threat, and my only real ranged damage dealer. They scared quite a few opponents, and sniped their share of the enemy heroes! 30 guys all told. Every single one converted. TK bows and quivers, new school skeletons. The unarmoured might of the army. 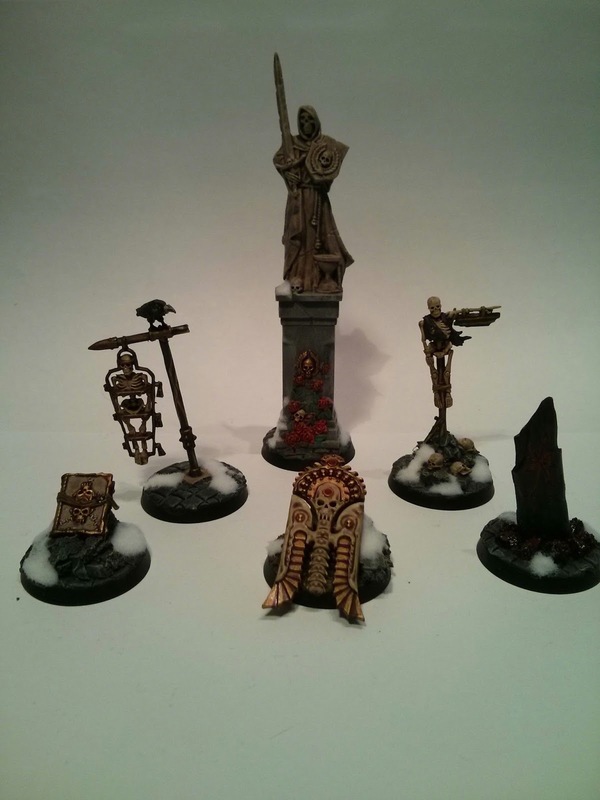 20 Grave Guards with great weapons. They deal tons of damage! Too bad they are so slow and vulnerable that they aren't worth it. They spent most of the weekend in my summoning pool, waiting for action. 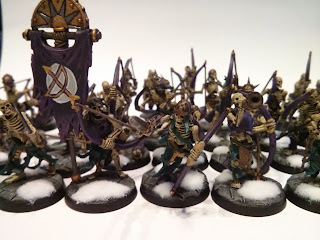 As with the skeletons, all converted. Mostly a light repose, and added new weapons. Never liked the original great weapons, so I added a variety of them! Lots of Chaos Warrior weapons here, but some various bits and bobs throughout. 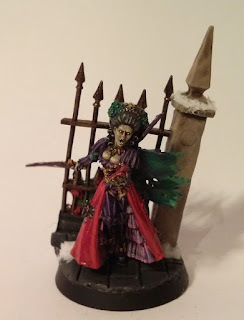 Really enjoyed how much personality I could get out of some fairly static models. Black Knights! Tanks extraordaire, killers impotent. They do no damage unless they are at buffed at least twice. They can however tank enormous amounts of damage. 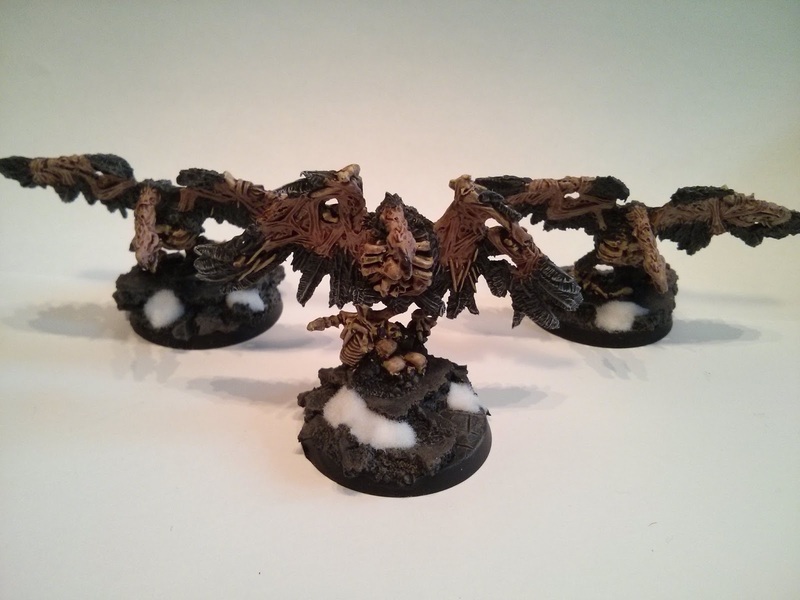 D3 models back is 2-6 wounds returned every single turn! 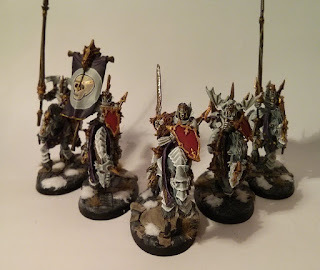 The real heavy hitters, my Blood Knights.Went with a new colour scheme. 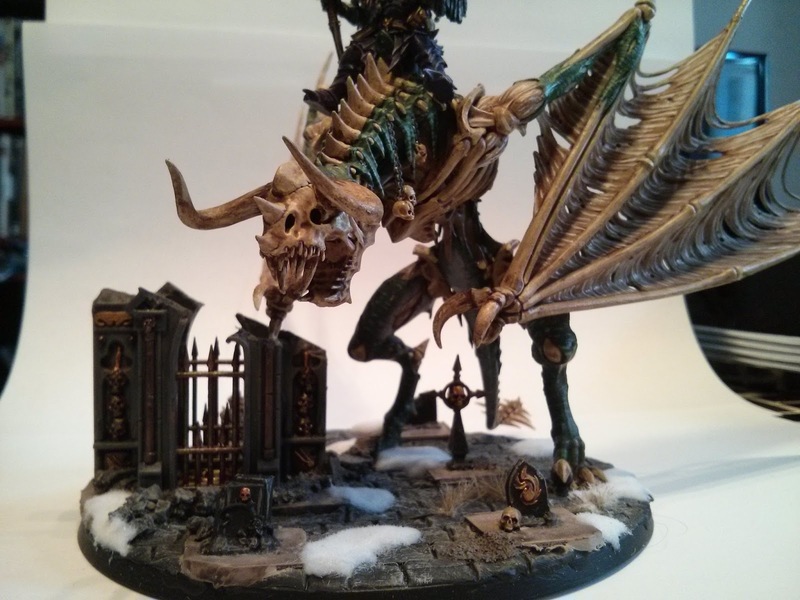 The Blood Keep is no more! Unfortunately, my freehand is terrible. 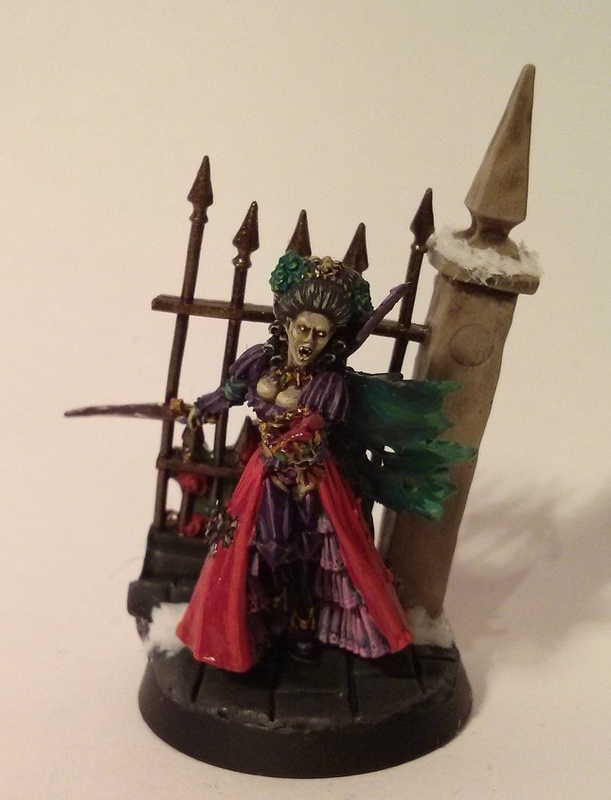 Red also represents vampires, so you'll only see that on Soulblight models. 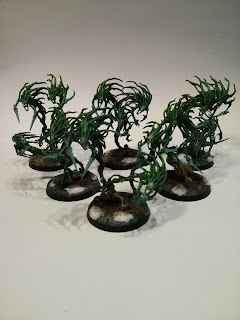 Spirit Hosts! Possibel MVP's. They never failed me and never underperformed. I'm seriously considering adding even more! Ethereal is a great rule. And every hit of a 6 being Mortal means you are only a decent dice roll away from shredding your foe. Carrion. Speed painted. Huge dissapointment. Not enough combat threat to capture objectives. I also played them wrong in most scenarios, so they failed to do what they should have. I did manage to paint up six of them though! So now I have a lot. 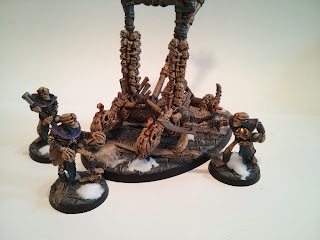 Screaming Skull Catapult. Metal. Unassembled. What a nightmare. Too bad they didn't do much for me either. Still, cool models. Oh, and I built two! 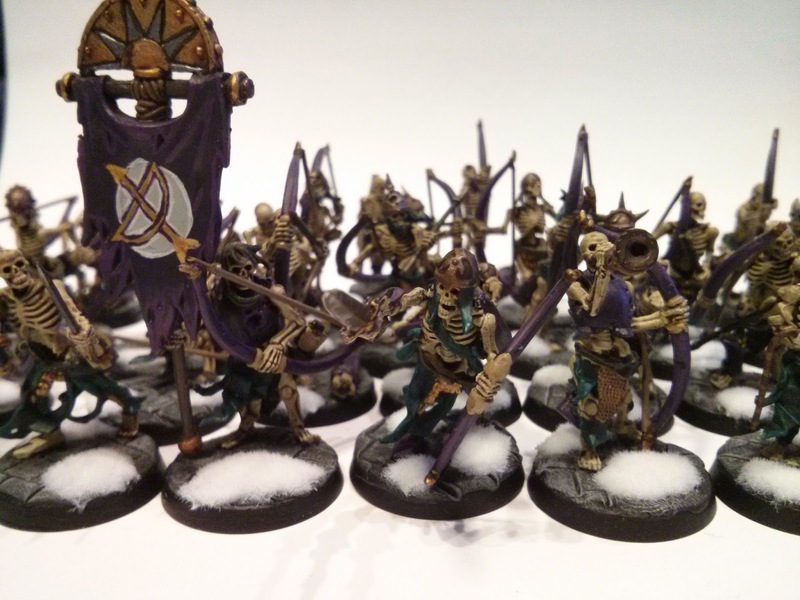 Two + Necrotect = undead Gunline. It's not great, but it shoots and it scares. Ushabti! Big and fighty and super not-tanky! 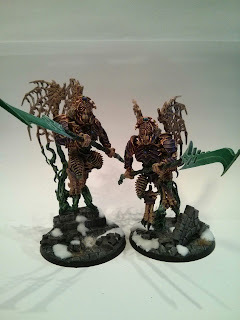 I love these models. So great. 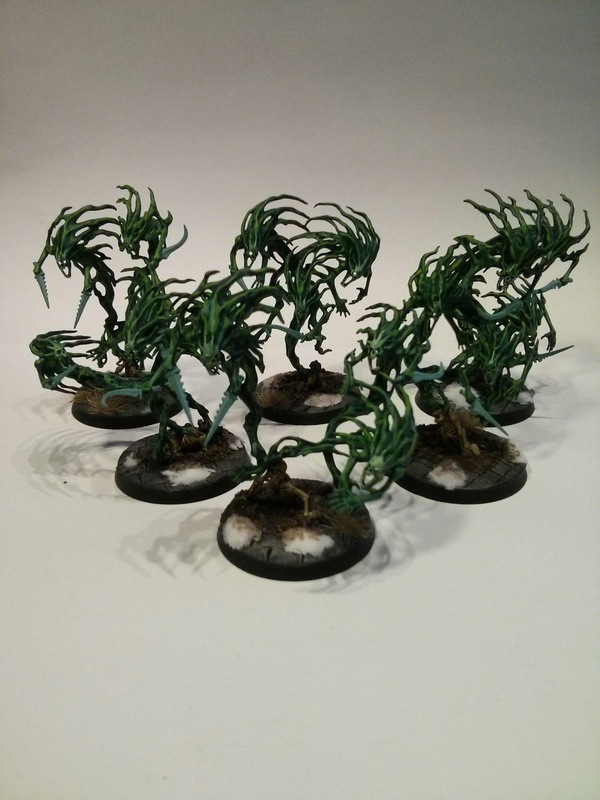 They also do very well in combat with lots of attacks with Rend and D3 damage. Beware of models with more than damage 1 though, they will tear the Ushabti apart. Another contender for MVP. The Bone Giant did great things the whole weekend. Rend 2 and Damage 3 is brutal! And a 33% chance to attack twice in a phase? Awesome. Just wish the model was bigger. It was huge back in the day, but now it's so small! The Morghasts did me a solid. Rend 2 and Damage 3 like the Bone Giant, but with more move, and a summoning buff. Great stuff. Want many, many more of these. The howl of the banshee came mostly from under use. She's not expensive, pools wise, but I still struggled to fit her in. Lots of unused potential here. 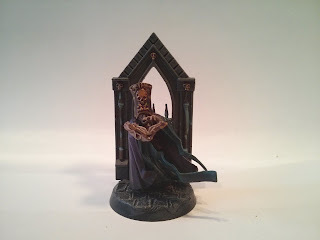 Converted Necrotect. As I mentioned, he buffs Screaming Skull Catapults by quite a bit. He also buffs the Ushabti and Bone Giants. Tempted to use him more, but he only really showed up for the catapults. 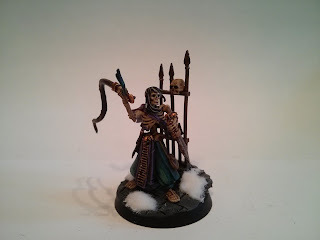 The Necromancer survived all six battles! Hanging back and casting spells is a pretty safe occupation, apparently. Never got much use out of hisVanhel's Dance Macabre, but the ability to shift wounds onto nearby units saved him in game 1. Welcome to the first ever episode of a Tales of Sigmar the brand new Age of Sigmar podcast! 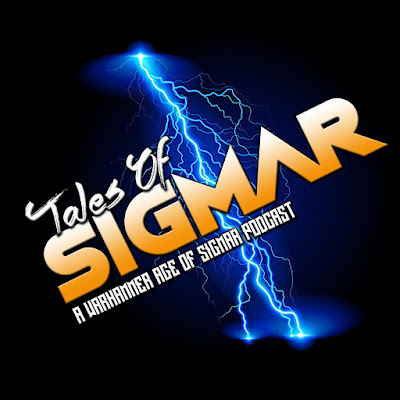 In this episode we introduce us, talk about the Flesh-Eater Courts, preview Bristol Smash and talk about our hobby progress recently. 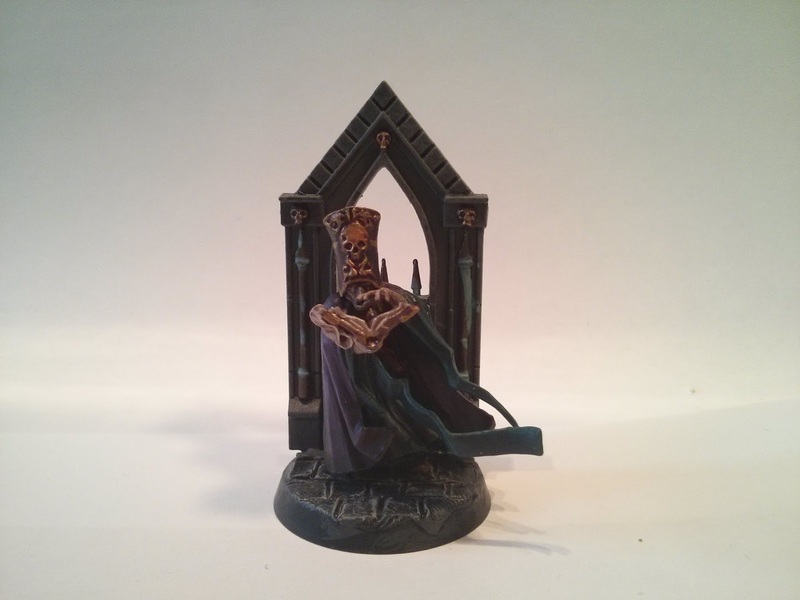 Although a weak voiced midget, Johan Zwerg is the most successful, self-appointed prophet of Sigmar in Venithya. People gather in their hundreds to try and catch a few words of his fiery sermons. Many suggest this is because Johan's lectern rests on the gut plate of the notorious Meneater Barag Sineater. Since working for Johan, Barag has enthusiastically embraced the Sigmarite cult, particularly the Flagellants' belief that sin can be eradicated by vigorous flogging. The Ogor surely agrees that sinners taste better after being tenderized with a couple of flails. I gave the Look-out Grot a Flagellant head and one of the tiny hammers that you can hang to the Flagellant bodies and used the crow's nest from the Ogor banner as a makeshift pulpit to represent Johan. For Barag, I swapped the Ogor clubs for flails, used more Flagellant pendants as hearings and some of the scrolls to decorate his belt. A bit of greenstuff to give him Flagellant style hair and I was ready for painting. I used the same palette of dirty yellow, green and red I used for the Penitent Brotherhood, but gave Barag a slightly more grey-ish skin. And now, with the five Ogors left on the sprues, I'm going to pay my homage to the 1990s incarnation of Golgfag's Meneaters. Stay tuned for some armoured, axe and club wielding Ogors!